If lovers can be more than a generation apart, so can good friends. After working closely together in several projects, including Gun Metal Grey <刑警> and L’Escargot <缺宅男女>, 54-year-old Michael Miu (苗僑偉) and 34-year-old Oscar Leung (梁烈唯) formed a close friendship for almost 7 years. In an interview with Oriental Weekly, Michael and wife, Jaime Chik (戚美珍) arrived early for fear of letting Oscar wait. Coincidentally, Oscar also arrived half hour early so as not to let the couple wait for him. The respect the two men have for each other is apparent not only in their consideration for each other, but also through their strong affinity. In 2006, Michael starred as an expert poker player in Dicey Business <賭場風雲>. 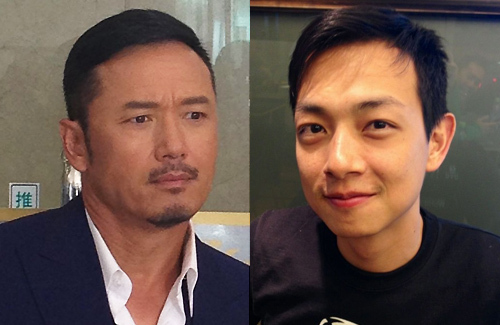 He remembered amusingly how Oscar was cast as the younger version of Bobby Au Yeung (歐陽震華). However, it was only after working together in Gun Metal Grey that Michael had a lasting impression of Oscar. Michael said, “In Gun Metal Grey, I had thought he was a flamboyant man, carrying old toilet paper in his pocket. It was only later that I realized he actually incorporated his own idea into his character’s personality.” Michael was impressed by Oscar’s serious work attitude despite not being cast as the first or second lead. Despite the age difference, both Michael and Oscar shared many common interests. Whether cars, soccer, or singing, Michael and Oscar are able to have deep conversations about their favorite topics, bridging their friendship further. Like Michael and Jaime, Oscar and his girlfriend, Tina, have been together for more than 10 years. Admitting that he is the temperamental one in the relationship, Oscar often throws temper fits at Tina. Not only is his girlfriend able to understand his work stress, she also makes sure that the apartment they share is always clean. Despite being the chauvinist one in the relationship, Oscar has since learnt to change his ways to suit his girlfriend. Although Oscar and Tina are in a committed relationship, they do not have immediate wedding plans yet. With his rising career, Oscar wants to focus on work first. He revealed that his current living conditions with Tina is similar to that of a marriage, and he feels no compelling reason to get married unless they have children. Oscar still wants to see more of the world before settling down with a family. I like Oscar, he seems to be a really underrated actor who deserves more attention. Ah, two of my favourite actors!! I think Michael Miu had a lasting impression when he filmed The Academy. As for Oscar, Forensic Heroes! I have always admired Michael Miu and I think he’d be a great person to befriend! I’ve also noticed Oscar Leung a lot in recent years and I’m so glad he’s finally got his big breakthrough last year. I can’t wait to see more of him and hope that his career will go a step higher 🙂 He deserves it for all the hard work and effort he’s put in. Oscar has famous friends that have helped him throughout the years. These friends have been a great network for him. I think Oscar could do very well in the business world. First noticed Michael Miu in The Academy and just fell head over heels for this old man. As for Oscar Leung, I remember him from Shine On You and also Love Bond; both very good series for him to breakthrough. I think Michael Miu is the type of guy who is good friends with everyone. Pretty sure I have read articles about his friendship with Bosco and other young actors too. He really does play the big brother and let everything bad slide off his back in order to make everyone happy.